Annual permit fees are charged for the connection of private alarm systems. There are penalties for false alarms. Residents who are considering the installation of an alarm system should contact the Police Department for installation and permit information. The legal drinking age in New Jersey is 21. It is unlawful to possess unsealed alcoholic beverage containers in any public place unless official permission has been granted. Retail consumption is restricted to the following hours: 7:00 a.m. to 2:00 a.m. Monday – Saturday; 12:00 noon to 2:00 a.m. Sundays. State law prohibits the consumption of an alcoholic beverage by either the driver or a passenger while in a motor vehicle. The possession of an unsealed alcoholic beverage in a motor vehicle is also prohibited. All dogs and cats that are at least 7 months old must be counted and licensed each year by the Borough of Florham Park as per Chapter 96 and Chapter 108 of the Code of Florham Park. Dog and cat licenses must be renewed by January 31st of each year. N.J. state law requires that all animals must show proof of a current rabies vaccination that is valid through November 1st of the licensing year in order to renew. There are no exceptions. For application and fee information, contact the Health Department at 973-410-5319. 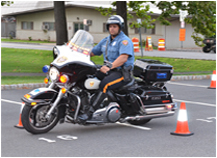 Florham Park animal control services are provided by Millburn Animal Control. Please contact the Florham Park Police Department at (973) 377-2200, and they will contact animal control. All calls must go through the Florham Park Police Department. Branches and brush between one and six inches in diameter and more than four feet long will be collected by the chipper during the last full work week of each month beginning in March and thru September. Brush should never be placed in the street and should be at the curb by Monday morning of the scheduled week. Once the chipper finished a road, it will NOT be back until the following month. Branches in cans will be chipped as long as they are not mined with anything and not sticking out of the can more than one foot. Firewood, logs, stumps, roots, or branches greater than six inches in diameter cannot be chipped. For branches smaller than one inch in diameter or less than four feet in length, please refer to Lawn and Garden Refuse. Brush and branches can also be brought to the Environmental Center on Saturdays between 8:00 am and Noon. Check with the Construction Department before undertaking any project to obtain the proper building, plumbing or electrical permits. Call 410-5346. Plan ahead. Make sure all final inspections have been completed before you make final payment to the contractor. As the property owner, you are responsible for all inspections which include permits for roofing, re-roofing, siding, fencing, repairs and renovations. A certificate of occupancy (“CO”) or continued occupancy certificate is required every time a property changes ownership, occupancy, or use of all commercial establishments and businesses. COs are available from the Construction Department. A fee is charged. Residential dwellings do not require a certificate of occupancy on a resale, however, a certificate of inspection from the Fire Official or designee for smoke alarms is required. A fee is charged. Applications for solicitation can be obtained on this wesbite under forms http://www.fpboro.net/forms/. Applications must be made to the Borough Clerk’s Office and permission granted by the Council before any canvassing or charitable solicitation may take place. Florham Park’s Community Bulletin Board is provided twenty-four hours a day free of charge on Cablevision Channel #21 and Verizon Channel #35. Florham Park non-profit, community service organizations may post announcements by submitting them two weeks prior to the date they would like them to appear. A contact name and telephone number must be included. Announcements may be faxed directly to FPTV at 973-765-9895, or they may be mailed to Florham Park Community Television, 111 Ridgedale Ave., Florham Park, NJ 07932. The Compactor is open from 8:00 am until noon on Saturdays all year, weather permitting. Any person coming to the compactor must present the attendant with valid proof of Florham Park residency. Commercial Vehicles are not allowed at the compactor, as well as trailers, rentals, or anything large than a pick-up truck, unless you obtain a letter of approval from the Director of Public Works for special circumstances. For a list of items not accepted at the compactor, see the Environmental Center listing under Public Works which can be found HERE. The Environmental Center is open from 8:00 am. until noon Saturdays during the year; weather permitting or when a holiday (i.e. July 4, Christmas or New Year’s Day) falls on a Saturday. Please visit the Department of Public Works page HERE for additional information. It is very tempting to feed feral cats because they are so cute and look just like domestic cats. These animals are NOT domesticated. They have been born in the wild and may carry diseases and in some cases, rabies. The feeding of feral cats and other types of wildlife also disrupts their natural feeding habits and can result in wildlife being concentrated at artificial feeding areas like your yard. It is against the law in Florham Park to feed feral cats and other wildlife. Violators are subject to prosecution and fines. Report feral cats to the Health Department. The hunting of game and the discharging of firearms within the Borough limits are prohibited. State Law requires the registration of firearms of any type. Applications are handled by the Police Department. The Free Public Library of the Borough of Florham Park is located on the grounds of the Borough complex. Expanded and renovated in 2005, this beautiful 16,000 square foot facility offers wireless internet access, two meeting rooms, and a collection of more than 46,000 books, periodicals and audio-visual materials. Membership in the Library provides online access to the catalogs of all the public libraries in Morris County through M.A.I.N (Morris Automated Information Network). People can request and renew online. Delivery to Florham Park of requested items from M.A.I.N. libraries and from libraries throughout New Jersey is provided. For information about the Library and the services it offers please visit http://www.florhamparklib.org/ or call 973-377-2694. Household trash is collected by private hauler twice a week. Contact: Pryer Disposal – 973-377-0176. Please remember that Recycling is mandatory in Florham Park. Free concerts are presented at the Gazebo during the summer months. The Gazebo Committee consists of a group of volunteer residents who are appointed by the Mayor. For more information check the website at www.florhamparkgazebo.com or email the committee at info@florhamparkgazebo.com. Grass clippings are to be placed in rigid containers at curbside for weekly pickup, except during the months of January – March or during the leaf pickup program in the fall. Any person “landlord” who owns property which is offered for rented housing space is required by law to file a statement with the Municipal Clerk which contains the name and address of the property owner, the name of the tenant, the name and address of the managing agent of the premise, if any, and the name and address of an individual representative to contact in the event of an emergency affecting the premise. Amended statements of registration are required to be filed within seven days of any change in the foregoing information. Lawn and garden refuse is to be placed in garbage cans or biodegradable bags for bi-weekly pick-up from the beginning of April thru the end of October. Barrels that do not have proper and secure handles will not be accepted. Barrels that have branches or brush sticking out more than one foot will not be accepted. Items that are accepted are grass clippings, potted plants (no pots), pulled weeds, leaves, and brush and branches smaller than 4 feet in length or less than one inch in diameter. Barrels larger than 35 gallons or weighing more than 60 lbs. will not be picked up. Lawn and garden refuse can also be brought to the Environmental Center on Saturdays between 8:00 am and Noon. Beginning the second week of October, weather permitting, the DPW will make two scheduled trips throughout the Borough to collect curbside leave, followed by a “mop up” after the second trip. Please have your leaves curbside by the Monday morning of your scheduled week. Leaves will be accepted loose, in garbage cans, or in biodegradable bags. Biodegradable bags are available at the Community Center, Monday thru Friday from 9:00 am to 4:30 pm. Please note that there is a limit of 5 bags per household. Please DO NOT mix branches, rocks, dirt, etc. in with leaves or they will NOT be picked up. Leave should never be burned and should not be placed in the street to avoid storm basin clogging and potential flooding. Leaves can also be brought to the Environmental Center on Saturdays, 8:00 am to Noon. An appointment is needed to apply for a marriage license or civil union license in Florham Park. It is recommended you apply at least two weeks before the ceremony inasmuch as there is a 72 hour waiting period from the time the application is filed to the date the license is issued. To schedule an appointment, obtain document requirements and fee information, please call the Registrar’s Office at 973-410-5319. Click HERE for additional information. Residents receive registration dates and fee schedules by mail each spring. Registrations may be made at the Borough Hall before the pool opening; thereafter register directly at the pool. Lessons and Swim team information is available at the Pool following opening. For further information on registration, please contact the Recreation Department at 973-410-5390. Municipal Court is held every Wednesday at 9:30 a.m. – Violations Bureau – 9:00 a.m. – 4:30 p.m. For additional information click HERE. Those wishing to set up Neighborhood Watch Programs will be assisted by members of the Police Department. Please contact the Police Department at 973-377-2200 for additional information. Applications may be obtained at the Clerk’s Office or online from the Division of Alcoholic Beverage for special functions. All permits must be approved by the Borough Clerk and the Chief of Police. The open burning of leaves and other debris is strictly prohibited. On-street parking is prohibited on all streets between 2:00 a.m. and 6:00 a.m. daily. Violators parking in Fire Zones or illegally parked in physically handicapped parking spaces will be ticketed. Free rabies vaccinations are held each November at the Borough Garage. At that time, a local veterinarian will vaccinate dogs and cats. This service is paid for in your annual license fee. For additional information please contact the Board of Health at 973-410-5319. Applications for raffles to be held within the Borough may be obtained from the Municipal Clerk’s Office, and must be approved by the Council at a public meeting. The fee is determined by the prize amount. For more information contact the Clerk’s office at 973-410-5319. The Recycling Center is open from 8:00 a.m. through Noon on Saturdays all year, weather permitting. Residents may drop off cans, bottles, newspapers, cardboard, etc. to be recycled. Residents are encouraged to bring grass, garden refuse, brush, leaves (no loose leaves or tarps), etc. to the Center. Logs, stumps, roots, etc. are not accepted. Curbside pick-up is provided every other week by JSI/Galaxy Carting. For missed pick-ups please call 732-684-4837. Please remember that recycling is required by law. Please click below for the current recycling schedule. Copies can also be obtained in Borough Hall. It is the responsibility of the property owner to keep sidewalks safe and in good repair. Borough standards and construction permits are available in the Building Department. It is unlawful for any person to erect, alter, or relocate any sign as defined by Ordinance without first obtaining a permit from the Construction Code Official and making payment of the fee required by Ordinance, except as exempt under provisions of Section 28-7 (Residential; and Non Residential Zones) defined in the Borough Code. Smoke detectors, or smoke alarms, are required by law to be installed in each dwelling unit or sleeping area in any structure in the Borough of Florham Park. The installation of smoke detectors shall be made in accordance with the regulations of the Fire Official, both as to the number of detectors needed for the area to be protected and as to the method employed. The inspection of each installation shall be by the Fire Official. It shall be unlawful for any person to convey title to any building in the Borough without having first procured a Certificate from the Fire Official indicating the premises to be sold or conveyed comply with the provisions of Ordinance 8-88. It shall be the sole responsibility of the owner to maintain every smoke detector in working order after it has been inspected and approved by the Fire Official. Snow and ice must be removed within 48 hours of daylight from the time the storm ends. If freezing conditions make removal impractical, the snow or ice must be covered by cinders, sand or salt. An application for a construction permit must be made, and approval of the plans must be obtained before starting work on the construction, alteration, or repair of a family swimming pool. Approvals are needed from both the Construction Official and the Health Department. Tax Office hours are 9:00 a.m. top 4:30 p.m. – Monday through Friday. It is imperative that the Tax Office receives in writing any change of address or change to a post office box to insure deliver of all future bills. When paying your tax bill please send the stub only with your check. Your cancelled check is your receipt. For your convenience, there is a Lock Box located at the Police Entrance to Borough Hall to use as a drop-off for Tax and Water payments. No cash should be put in the box -only checks with the proper payment stub. PLEASE NOTE THAT ANY POSTDATED CHECKS WILL NOT BE ACCEPTED. The Property Tax Reimbursement Program is designed to reimburse senior citizens and disabled persons for property tax increases. To qualify for the reimbursement you must meet certain criteria. For more information please call 1-800-323-4400. Tents require a permit. Please check with the Construction Office at 973-410-5346. The Borough’s Water Department operates a water supply system which consists of three wells, two storage tanks and water distribution lines. The present number of wells and underground aquifer supply sufficient water to the 3,100 system users. The Water Department is a self-supporting utility. Solid waste is collected by Pryer Disposal Company, with individual residences and business establishments responsible for payment of the collection service. New Jersey State law requires all residents to provide proof of contract for solid waste disposal. Electricity and gas are supplied by Jersey Central Power and Light and Public Service Electric and Gas Company. Collection is handled by the Sewer Utility. Please call 973-377-1330. Questions regarding permitted uses should be directed to the Zoning Officer Janet Doherty at 973-410-5346.